Snickerdoodle is 3 and has been daytime potty trained since he was around 22 months give or take the occasional normal setback. The nighttime has taken a bit longer as it seems every time his bladder catches up with his body size, he goes through another big growth spurt and returns to the occasional nighttime accident. We've had him in Pull-Ups off and on but quite frankly, I'm tired of throwing away clean dry diapers most mornings and was looking for a washable option that would hopefully save us late night sheet changes on the occasion that he does have an accident. Currently, even when he wets his Pull-Up, he wakes and changes into a clean one so he's not a heavy wetter. That's where my latest brainstorm came into play. 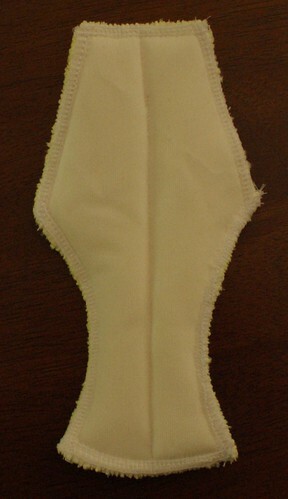 I created a small pad that can be inserted between the layers of regular briefs. I picked up his favorite undies in a size larger than what he's currently wearing. I don't even think it needs to be sewn into place which means that once he outgrows the occasional night accidents, the undies will still fit. 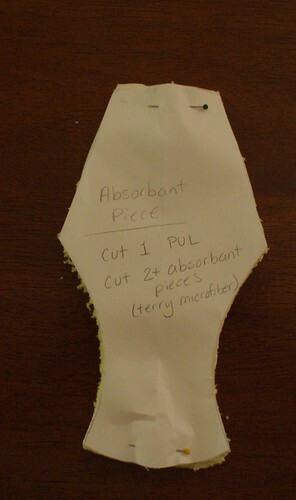 Terrycloth or something absorbent - enough for 2+ layers. I used some microfiber terry cloth found in the automotive department sold as shop rags. A shammy might be good too. Start out by creating a pattern for the front pocket of the underwear. Using a piece of paper, trace the front panel area. 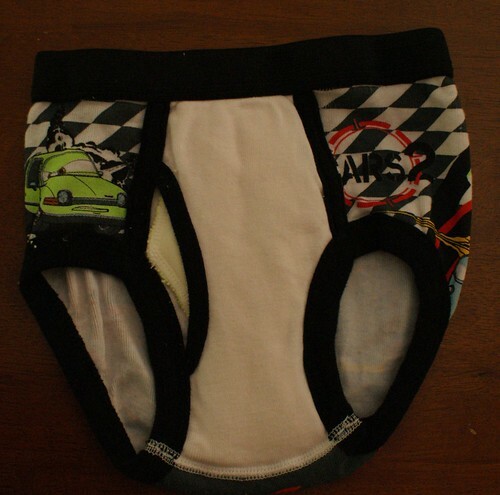 In the sample underwear here, it is the white area. Trace just inside the lines ignoring the pocket opening. 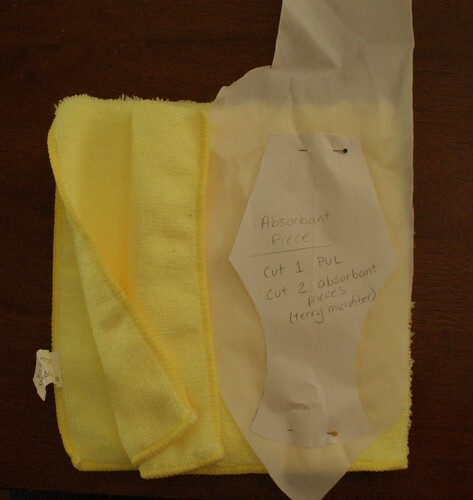 Now you need to stack as many absorbent layers as you want with a piece of PUL on top (shiny side towards the absorbent layers) and pin down your pattern piece. Cut it out carefully. My scissors don't really like going through that much fabric but I held tight to all layers and carefully cut the stack out. This terry microfiber sheds EVERYWHERE so I took my stack to the sewing machine (minus the pattern piece) and first stitched from top to bottom down the center then moved over to the serger and stitched the edges together. The center stitching was to hold all layers together. My serger isn't the best and tends to act up when I feed it too much at once. The center stitching helped a lot. The final step is to insert the insert into the undies. I didn't stitch these in place, I think they'll stay just fine and that means I can just make a few of these that can be moved into whatever underwear he wants to wear. They are machine washable too which is the whole point - no more disposables!! I did not enjoy the night-time sheet and clothing changes either but I warned my husband one week that the pull-ups and diapers were coming off that week and that seemed to have stopped the night-time wetting nearly 100% since she did not enjoy me fully waking her and cleaning her with all the lights on. Just to be sure our daughter did not have an accident in our bed (where she seems to migrate to when daddy leaves and mommy is still sleeping) I put on her undies and then a pull-up over that before she goes to bed. She is able to get many wears out of the same pull-up, probably a week or more since we place it over the undies to keep them clean and she will know if she wets herself, too. I have thought to do what you did during our potty training time, perhaps with my son. Thanks for this tutorial!